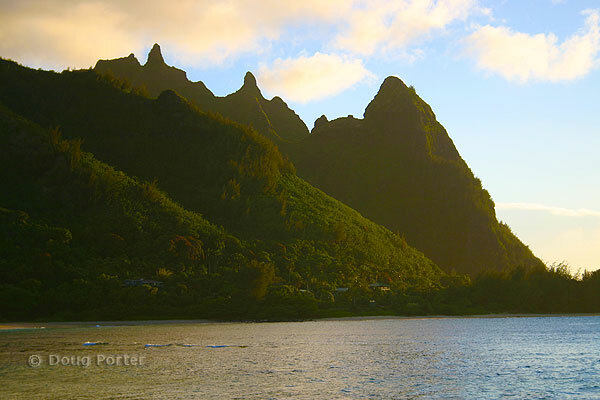 Mount Makana or "Bali Hai"
Bali Hai is the north shore's canvas for the last sunset in the United States each evening. Its majestic profile is the beginning of the Na Pali cliffs along the north shore of Kauai and provides a romantic backdrop for ocean cruises, helicopter flights, and spectacular hiking adventures. 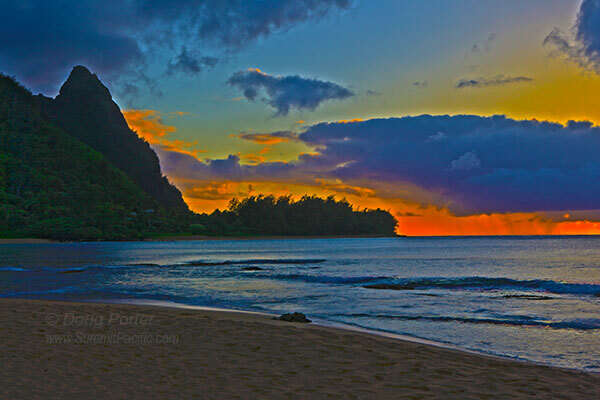 It is also the million dollar sunset view from dozens of Kauai vacation rentals in Princeville. The actual Hawaiian name of this pyramid shaped peak is Makana or Mount Makana but the 1960's movie South Pacific featured it as the exotic forbidden island of Bali Hai and the name seems to have stuck and it's getting harder and harder to find anyone in Kauai that remembers the original name. The musical South Pacific was based on the book Tales of the South Pacific by James Michener. During World War II, Michener was stationed on the Espiritu Santo Island in Vanautu (then known as New Hebrides). From his island, the Island of Ambae is visible on the horizon and Michener based his fictional Bali Hai on Ambae. Michener uses, "Bali Hai" as a place of happiness and innocence that although is very near it is always unobtainable. In his memoires, Michener writes, "On a rude signboard attached to a tree, someone had affixed a cardboard giving the settlement's name, and it was so completely different from ordinary names, so musical to my ear that I borrowed a pencil and in a soggy notebook jotted the name against the day when I might want to use if for some purpose I could not then envisage: Bali-ha'i."